Best Abs Workout for Women at Home: The abs, also known as the rectus abdominal muscle, function with a group of core muscles and also the obliques which wrap around the sides of the torso. These are bands of muscles that connect the pelvis with the rib cage. Core muscles connect the upper and lower body and are essential for the movement of the entire body. Firstly, if you have a lot of belly fat, you will have to burn it all out before beginning with the abs exercises. Before shaping your abdominal region, cutting down the fat is important. For weight loss, aerobic exercises and strength training are a must. Then comes shaping. There is an end number of abs exercises that you can perform at home itself. 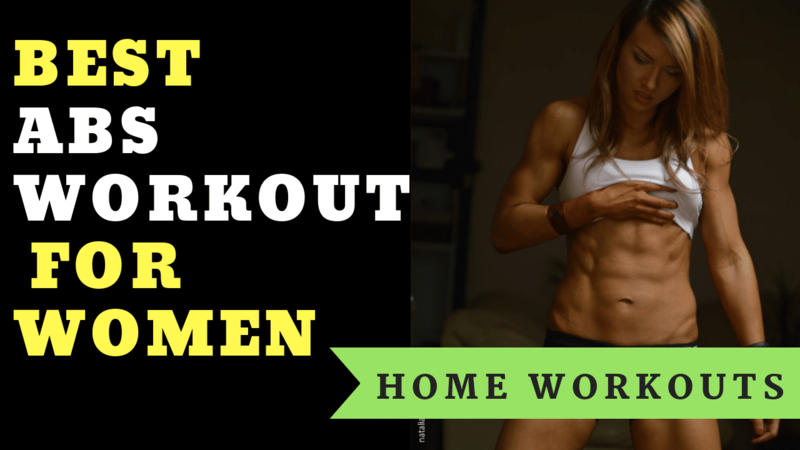 Best Abs Workout for Women at Home, Here are few exercises to get you started. These crunches involve core, abs, lateral abs, lower abs, and front hip flexors. It targets the lower abdominis and more specifically, the obliques. Lie down flat on your back with your hands behind your head. Bend your knees and lift them towards your chest. Twist your upper body and rotate to the right to meet the left knee with the right elbow. While doing this, make sure that you extend your right leg straight out. Now try the opposite side that is your left elbow trying to touch your right knee. Repeat this exercise till the required number of reps are completed. Touch your head lightly to avoid neck strain. Twist your torso on each rep. 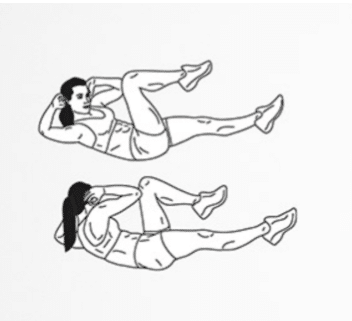 Lying leg raises helps to get rid of belly fat, build abs and toned thighs. Hanging leg raises might affect your back but in lying leg raises, back muscles are not involved. Hence, you can prevent back injuries and back pain. This exercise is perfect for improving flexibility and enhancing the alignment of your spine. Lie with your back flat on the floor, legs straight and place your hands under your glutes. Raise your legs straight up until they make a 60° angle with the floor (for more strain go for 90°). Exhale as you perform this movement and hold the contraction at the top for a second or two. Now slowly lower your legs back to the initial position while you inhale. Try to use variations by forming your legs into V position at the top of each rep.
For advances, you can add on some weight in between your feet. This exercise is most likely seen in yoga practice. You can feel the effects from head to toe as it involves usage of the entire body. It is one of the best exercises to be performed before the sun because it encourages blood flow and both energizes and calms your body. Lie on the ground on your belly with your legs extended straight behind you. Place your palms beside your ribs and bend your elbows so that your forearms are perpendicular to the floor. While inhaling, press your palms firmly lifting your torso, hips, and the top of your thighs. Your shoulders should be stacked over the wrists. Roll your shoulders back and try pulling your chest forward through your upper arms. Now look up to the ceiling and stay in that position for a while. Take 5 to 10 deep breaths before beginning the downward position. Make sure you stretch along the upper side while doing the upward dog portion. Avoid doing downward dog if you have a back injury or high blood pressure. 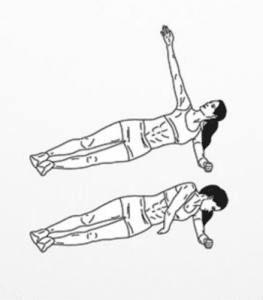 This ab exercise is good for training your obliques and provides stabilization to your spine. It strengthens your core and engages multiple muscles at a time. This exercise will definitely boost your mood as it keeps every part of your body active. Let’s see how it works. Begin with an elbow plank and extend your right leg out to the side, tapping your toes to the ground. Now bring your foot back to the plank and repeat the same with your right leg. Do this movement till the required reps are complete. Make sure you don’t let your shoulders, head or hips sag or it can lead to injuries in the muscle. Maintain a proper distance between your hands, this will help maintain stability. Side plank rotation helps tighten and shrink your waistline. 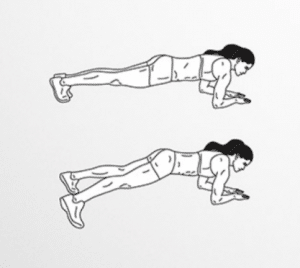 It activates the deep abdominal muscles, improves balance and increases core strength. This exercise is best for boosting your performance so make sure you religiously complete your reps as required. Begin with a side plank with your right shoulder over your elbow. Your body should be in a straight line. Now lift your left hand toward the ceiling. Twist your torso forward and bring your left arm under your body. Repeat this exercise and then change sides. Exhale as you slowly twist your torso and inhale as you raise your hand. If you find difficulty doing this exercise try taking the support of your knees. Your shoulder should be able to stabilize your position. Side bridges improve stamina and give stability to your body. It tones the lower body and corrects your posture. To improve your core strength, this exercise should be performed regularly and with proper sets and reps.
Start in a side plank position so that your body forms a straight line. Being your left hand as the support, place your right hand on your waist. Exhale as you lift your pelvis off the floor and hold for three seconds. Then slowly lower your pelvis back to the floor to complete one rep. Repeat this exercise for the required number of reps or do more if you can. 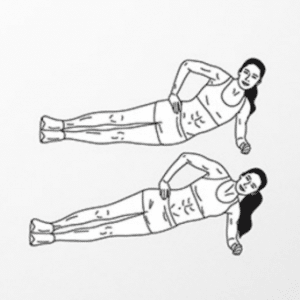 Perform these abdominal exercises at your place to build overall strength and tone your body.